The Panjshir emerald region occurs between the Dar Khenj and Rewat tributaries of the Panjshir River, on the southern ridges of the Hindu Kush Mountains in Kapisa Province. The emeralds are predominantly at sites of corrugation, fracturing, and hydrothermal alteration of the carbonate rocks in hosting dikes of gabbro-diorites and quartz porphyries (Khenj, Rewat deposits) and less often in phyllite and quartz-biotite schists (Eastern Khenj, Mikeni, Darun deposits). 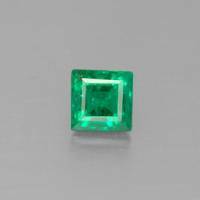 The colour of emeralds is often zoned with increasing intensity from the core to the rim. They display a strong dichroism in yellowish green and bluish green tints. Inclusions are represented by carbonates, limonite, pyrite, and liquid carbon dioxide.